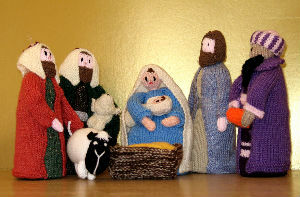 Our knitted 'knitivity' is now in its second year and its cheerful characters have been finding lodging in people's homes, parties, events .... And wherever they went, a diary was kept of comments, pictures, prayers. Here are some examples. The nativity set visited the Village Barber shop on the corner of Cedar Road and Shinfield Road. All those that were having their hair cut enjoyed seeing us. Keith Bellamy from Christchurch Court liked the nativity scene. He was pleased how well the characters were made. Nice touch in the social room. Today we travelled to Basingstoke with Brenda to Saxon Wood School. The children selected each of us from the box and chose where we should stand on the table to make a Nativity Story display. It was quite tiring for us as they kept moving us around! ... It was good that the children instantly recognised who we all were and knew our story already. We loved our visit to school and the children were very excited to see us. Mary has brought us over to see Theo and Gerry this afternoon. Theo really enjoyed feeling us all and gave us such love. She thanked us for making the time to visit us knowing this to be Christmas Eve ... Julie will also be taking us to midnight Mass to be home at Wesley for Christmas. Thank you, dear Lord, for showing us love and caring for us all. Amen.